The new lottery is to be launched by Harrogate Borough Council. A North Yorkshire council has been giving more details about a new lottery which aims to boost funds for local charities. Sales for the online-only The Local LOTTO which is being introduced in the Harrogate District are due to get underway next month, with the first weekly draw scheduled for September 8. Tickets cost £1 with 60p going to local good causes, while the remaining 40p is split equally between prize money and running costs. The project team for Harrogate’s The Local LOTTO sees Harrogate Council partnering two local community groups and working alongside an external lottery management company. The Oxford-based Gatherwell Ltd was launched in 2013 with the aim of helping to raise money for good causes. It has been paid an initial fee of £3,000 and will receive 20p from each ticket sold. The company currently manages around 40 lotteries across the country for a range of organizations. Organisers say The Local LOTTO is an easy way of helping local charities at a time of Government cuts and continued austerity. As well as the £25,000 jackpot on offer there is also the standard prize offering three free tickets for a future draw and further prizes for £2,000, £250 and £25. 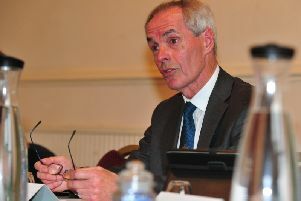 Outlining the project to an invited audience of charity volunteers and community groups from across the Harrogate District at a meeting at Harrogate’s civic centre this week, the Council’s director of corporate affairs, Rachel Bowles, said the Lottery was not about Harrogate Council making money for itself. The Council was assisting efforts to offer another way of raising income to help fund the local voluntary and community sector. She said around 80 per cent of all charitable donations went to national charities, with only 20 per cent going to local good causes. She thought most people would probably give more to local charities if it was made easier; and The Local LOTTO offered that possibility. There will be two types of £1 ticket available; one where 60p goes to The Local Fund - established in January 2018 with the aim of encouraging “local giving” to assist in providing long-term funding support for local groups. The Local Fund is managed and administered by the Two Ridings Community Foundation which is working towards offerring around £100,000 in grants every year. The other type of ticket donates 10p to The Local Fund with 50p going to a selection of local charities, with each ticket-holder able to choose where they want their money to go.